Pomorie hosts the 18th Congress of the European Spas Association. Over one billion euro has been invested in the wellness and spa industry in Bulgaria over the past twenty years. The sector has been the target of most of the recent investments in Bulgaria’s tourism. This became clear from yesterday’s speech of Stefan Sharlopov, President of the Bulgarian Union for Balneology and Spa Tourism, delivered on the sidelines of the 18th annual congress of the European Spas Association. The preliminary meeting was also attended by Martin Plachy, President of the European Spas Association and its Secretary-General Joachim Lieber, Bulgaria’s Deputy Minister of Economy, Energy and Tourism Ivo Marinov and Pomorie Mayor Ivan Alexandrov. “Bulgaria has the second largest resources of mineral water and healing mud after Iceland, but these resources should be developed and exploited properly,” Sharlopov said. In his words, Russian and Arab companies have shown interest in project in Bulgaria?s spa sector. 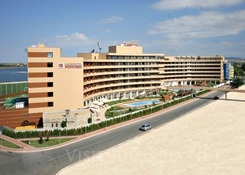 Bulgaria already has 300 spa hotels that have been awarded quality certificates by ESPA.